How does bad weather impact UK public serotonin levels? We all know the weather in the UK is a big topic of conversation at all times of the year, and it’s often what we are known for in the broader international community (everyone associates the UK with rain!) but how could the general weather pattern impact the public’s mental health, and general attitudes towards each other and life in general? Bad weather is no joke when it comes to mood, and is proven to actually make people feel depressed! There is even an official medical condition known as “winter depression” which describes how people’s mood can be worse in the winter time. However the effects of this alter greatly between each person, which is why there isn’t a countrywide diagnosis of this condition. The science behind this is to do with your central nervous system, and more specifically the neurotransmitter called “serotonin”. This is known to be a mood regulator, and people with low serotonin levels often find it trouble sleeping, and are more likely to suffer from depression. The best way to tackle this issue proactively is to up your serononin production. Now technically you aren’t going to be upping the level by ingesting it, moreover you will be taking the vitamins and nutrients that promote the optimum level of serotonin from your body. This allows your system to self-regulate the amount it needs, and prevents deficiencies. You can ingest foods that contain 5-HTP which converts into serotonin, or you could take serotonin specific tablets. If you prefer chewable serotonin supplements, then you can find gummies online in many places. Remember to monitor your mood throughout the winter, and make the dietary changes first when you feel down. You can also boost your serotonin levels through a good diet, exercise, and positive thinking. Follow EWI for more weather related blog posts like this. Posted on March 4, 2019 March 4, 2019 Leave a comment on How does bad weather impact UK public serotonin levels? You may remember that in the Northern counties of England, and even in some southern counties, in spring of 2018 there was extreme snow in many areas far later than seen in previous years. This snow was apparent in some places as late as May, you can see various reports on this here, and here. And you may have been effected by the devastation that the “beast from the east” brought to the country, with many losing power, and having furniture damaged by the extremely cold temperatures. However some of you may have noticed that your outdoor furniture wasn’t affected by the cold, and interestingly enough this is because it is classed as all weather furniture. 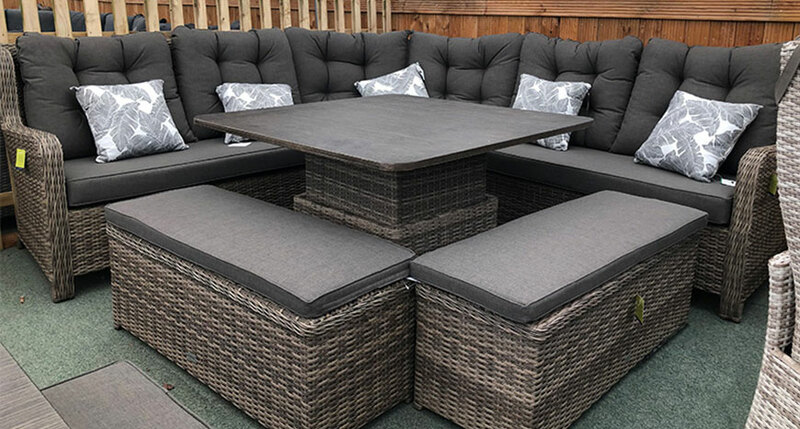 One of the most popular types of all weather furniture is synthetic rattan, and I’ll explain how it is weatherproof below. Aluminium – the rust buster. So if you remember your chemistry class as a child, you’ll recall that there are certain metals that go rusty, and certain metals that don’t. Well aluminium is one of those metals that doesn’t rust, and so it makes it really good to form into furniture frames to be left outside. UV stabilization of plastics – no more sun damage. We all know about UV light, we hear it all the time about wearing sun scream, but what if your furniture could have sun cream of its own? Well that’s what these synthetic rattan strands effectively have done to them, a permanent sun cream layer applied, known as UV stabilizer, which prevents the sun from degrading the material, and provides you with something that doesn’t rot or fade. You can browse a UK provider of rattan garden furniture here. You can also leave comments with any questions about weatherproof rattan furniture, or any of the extreme weather we had this year. And remember, continue to support Extreme Weather Impacts and we’ll bring you more content like this. Welcome to the new website of Extreme Weather Impacts. Some of the historical articles that were previously used have been restored for educational purposes as I think they’re really good. No copyright infringement intended, and if you want them to be removed (a shame, but I understand) then simply email me and I’ll try and replace them with my own work in due course. It’s important that in periods of political unrest we don’t forget about long term causes such as the environment, as in the end all we can hope to achieve is leaving a fit world for the next generations.